Interested members of the public often ask us how we catalogue dolphins. How do we monitor them? What happens with all the hundreds of photos that we take of them? Our members (Adoptees) are very knowledgeable as to how we track the dolphins, through their monthly newsletters, so we thought some of you out there might like to understand a little more about our monitoring work also. While many of our dolphins are currently off gallivanting around North Wales and the Isle of Man, we’re still sorting through our data from the summer, in fact we are currently writing a paper that reviews all our data from the time the project first started in 2001 up to this year! 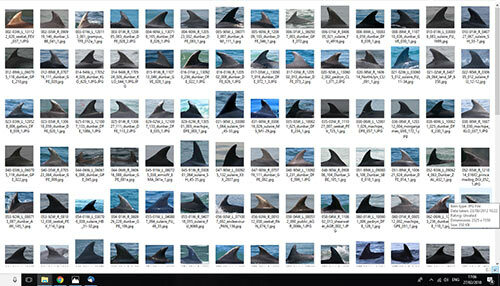 That’s a lot of work- and an awful lot of fin photos to look at! Many of the dolphins that we first saw in 2001 are still around, and we have known that some of our adoptable dolphins have been in the catalogue for nearly as long, for, Flint and Smoothy were added to the catalogue in 2003. For our analysis, it’s important that our catalogue is up to date. We are continuously reviewing and adding to it. As dolphins are not normally born with permanent marks that we can use to identify them, we usually wait until they have acquired marks of their own before adding them to the catalogue, so we generally have a few new fins to add every year. Although it’s hard to tell a dolphin’s age just by photographing them, we do also occasionally encounter animals that we think might be adults visiting from another part of the population. These are usually large, adult individuals with very well marked fins that we think we would have noticed earlier if they had been in the area before. As marks are caused by injuries to the fin, often through other dolphins when they bite each other, fresh nicks and notches stand out. 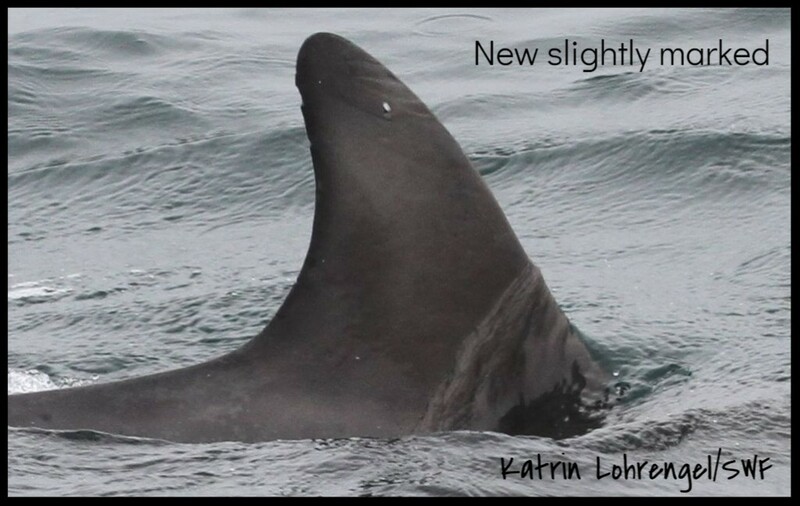 While it may be easy to miss a small, fresh notch, we do occasionally encounter animals with positively ragged fins that are well healed up, in which case we often assume that these animals are visitors from other areas. This happens less in Cardigan Bay, but more frequently in North Wales and Liverpool Bay, particularly in the winter, which has led us to believe that there may be some animals who prefer North Wales to Cardigan Bay, and that’s why we rarely encounter them down here. Whenever we add a dolphin to the catalogue, we first need to assign it to a category: unmarked, slightly marked or well-marked. Unmarked animals have smooth fins without nicks and notches in the edge of their fin and can usually be identified only based on the colouration of their fin and scarring. An example of such an unmarked dolphin would be Berry. Although she is very familiar to us and easy to recognise in good light, her fin is very smooth and it would be hard to identify her if we only saw the outline of her fin. 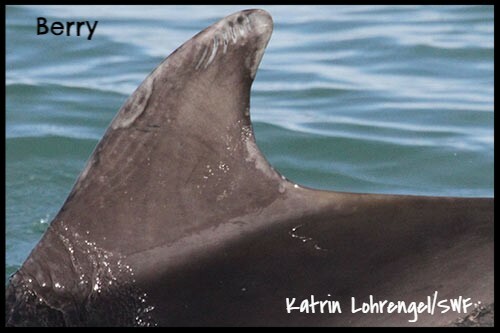 Slightly marked dolphins have small nicks and notches on their fin, which means we can identify them based on the outline of their fin from either side, but, overall, the original fin outline is not strongly altered. Lumpy would be an example of a dolphin in this category. 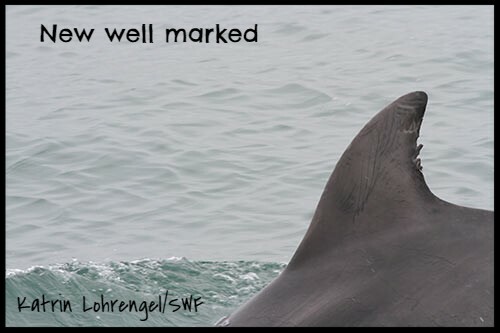 Well-marked dolphins have large nicks and notches in their fins, and can often be identified even from poor or distant pictures. Most of our adoptable dolphins like Voldemort,Chris and Smoothy fall into this category. 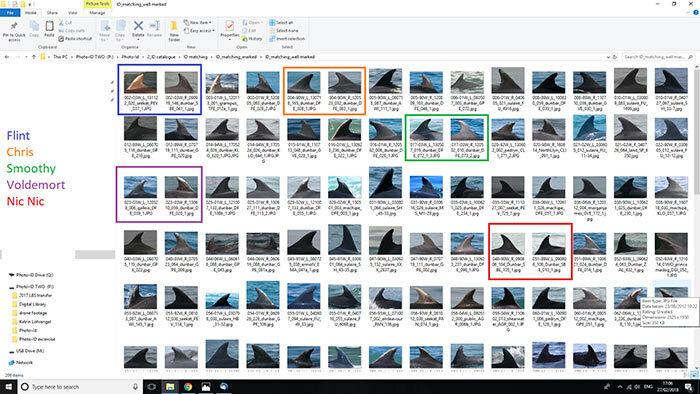 Once we’ve assigned the dolphin to a category, we can give it a name, and by that we don’t mean the nickname that you know your adoptable dolphins by, but a code that identifies them in the database. For example, Voldemortis 023-03W in the catalogue. This means he’s number 23 in the catalogue, was first seen in 2003 (03) and is in the well-marked category (W) = 023-03W. The nicknames by which that you know our dolphins, on the other hand, are given in a lot less systematic a manner! Some of them are named after the shape of their fin, such as Nic Nic and Lumpy others are tributes to our current favourite reads, for example Voldemort! Nicknames are much easier to remember than numbers and it can make it a lot easier to put a name to a fin when you’re doing ID, so apart from being just a nicer name for the dolphin, they are also quite handy! I hope this has been interesting reading! Hi Sam. We’re VERY pleased to hear that! Thanks for visiting. Please spread the word !